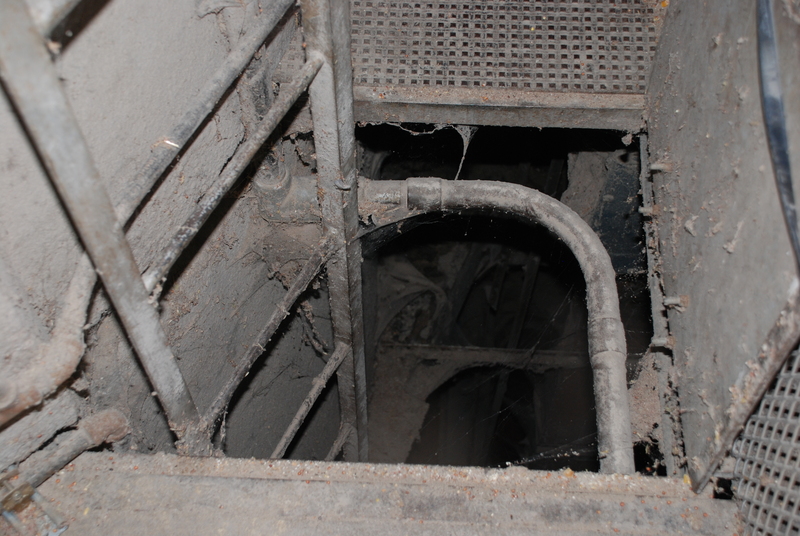 Some time ago, one of our readers requested the picture of an elevator pit. 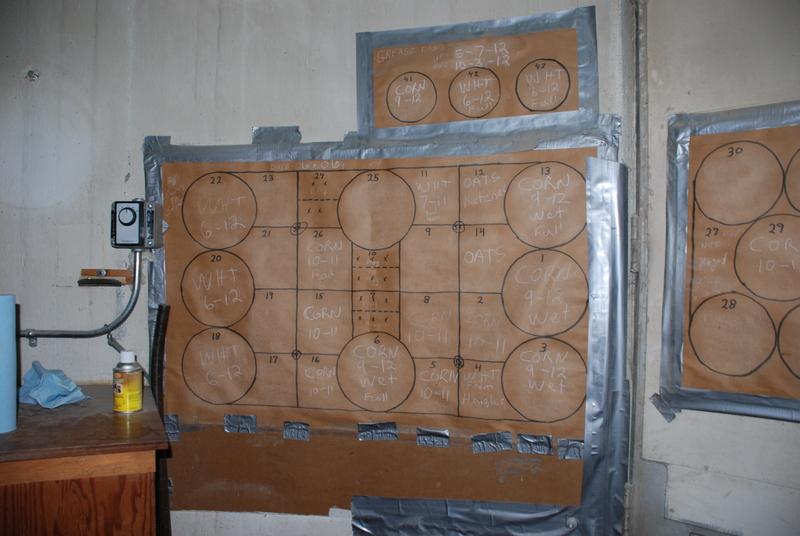 It is one of the more unglamorous parts of a grain elevator, but as I was going through old photos, I found one. 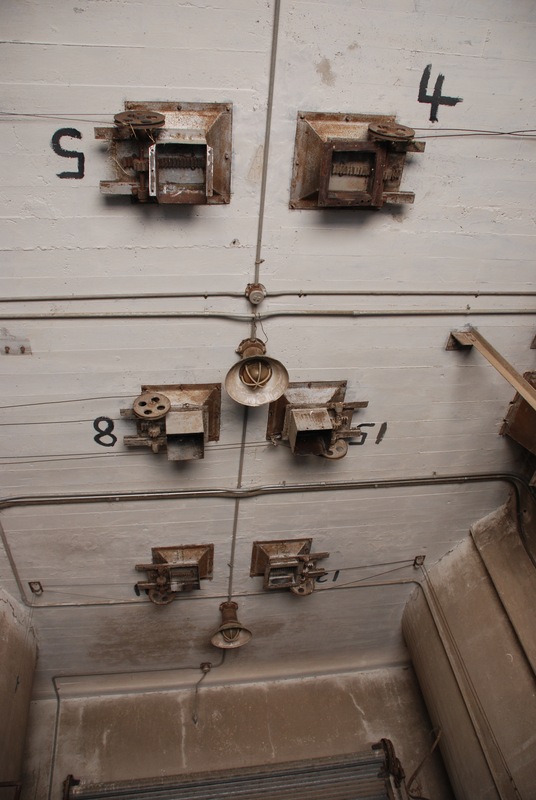 I also found many interior elevator pictures that have not made it to the blog because of their, well, unattractiveness. 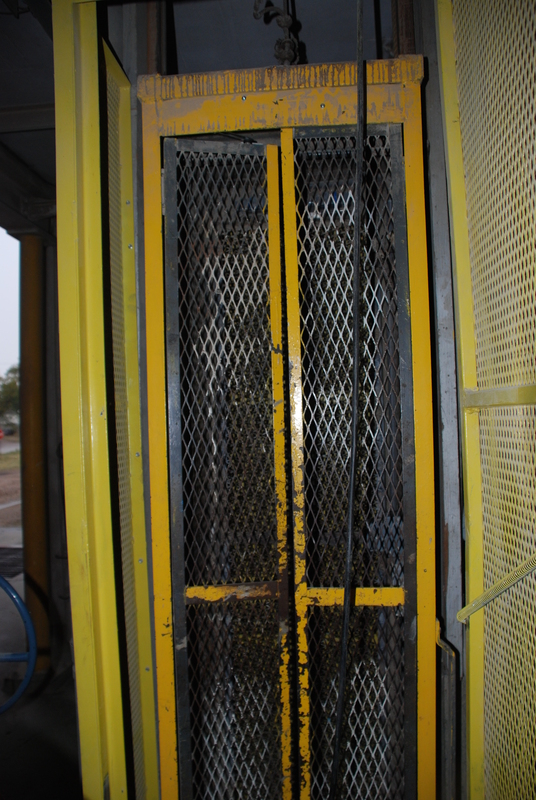 But a review of the parts and pieces, terms and descriptions, and interior appearance of an elevator is in order. Pit access by ladder. The leg is visible. Hanover, Kan.
Sloped bottom funnels grain to the base of the leg. 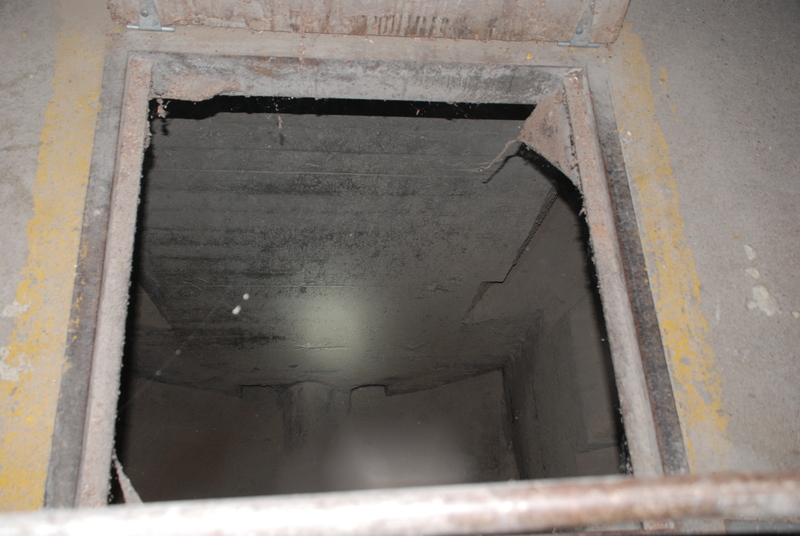 The bottom of the lift showing the shaft. 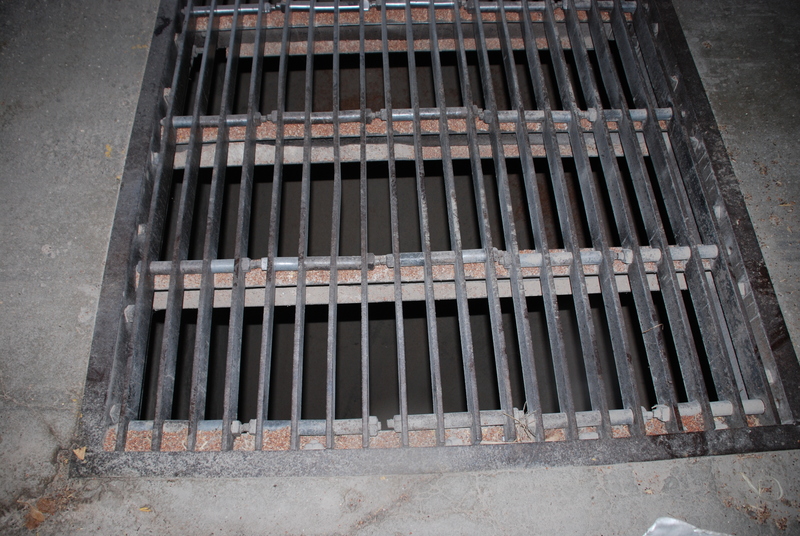 Current safety regulations require a retrofitted cage. This elevator holds beans in two overhead bins. The bins hold milo, and “F” means the bin is full. Cup dimensions and spacing are given in elevator specifications. 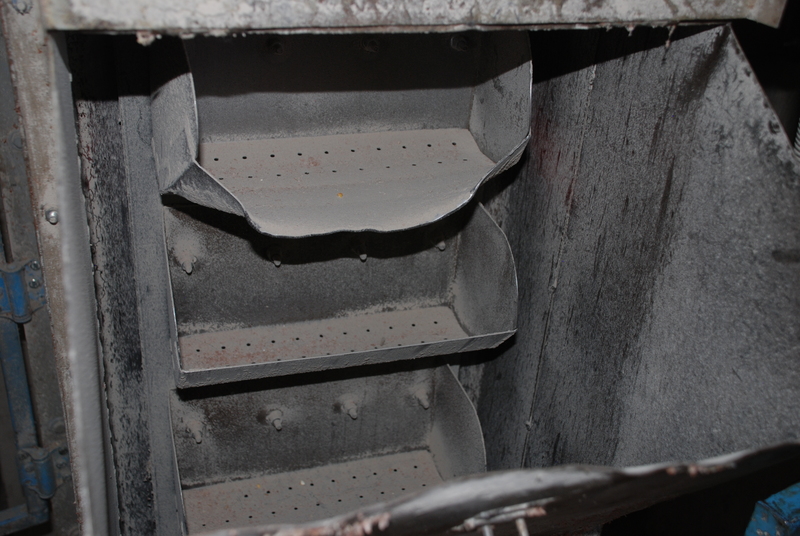 The leg conveys grain from the pit to the top of the bins. The construction record was written with painstaking attention to detail. Our friend Linda Laird has asked if the Tillotson Construction Company’s records included any Kansas elevators. The answer is yes, and here’s an example. 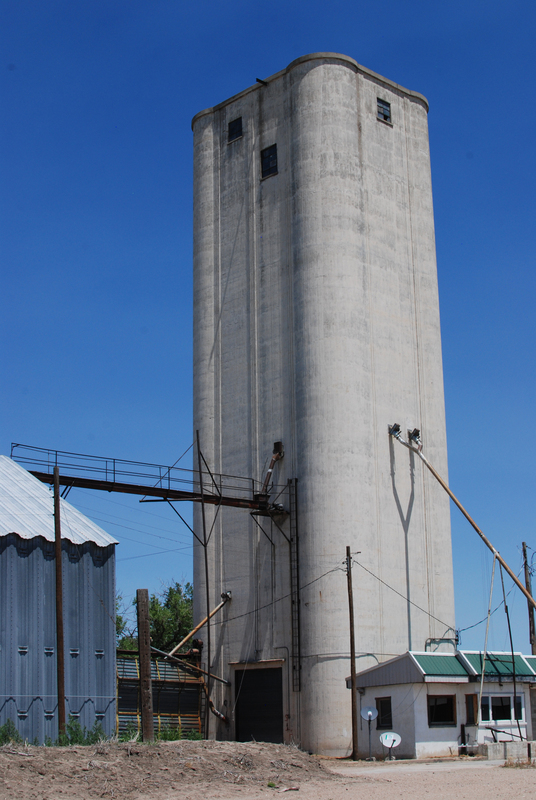 Tillotson’s Moscow, Kan., elevator, right, was built in 1948. The annex had to come later. Photo by Gary Rich. Main slab steel (straight) 1 in diameter at 6 inch o.c. 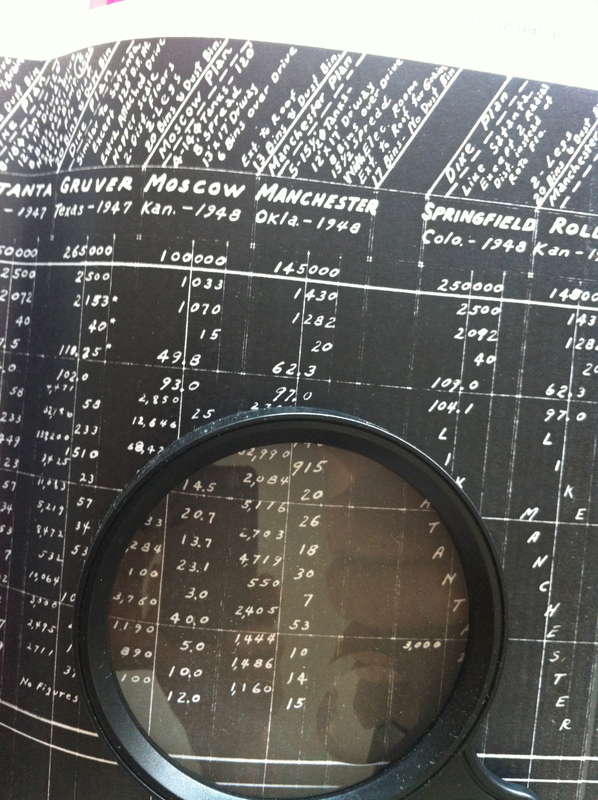 Tank steel at bottom (round tanks) ⅜ inch diameter at 9 inch o.c. Looking down the crowded streets of Moscow at Tillotson’s elevator, far right. Photo by Gary Rich. Load out spout 8.25 inch W.C.
Cupola spouting 8.25 inch W.C.
Flat storage at Traer, Kan., for farm equipment, and an unused elevator. During the heyday of elevator building, no sooner did an elevator go up, than it filled up, and left a town wanting for storage. The first option was to add an annex. 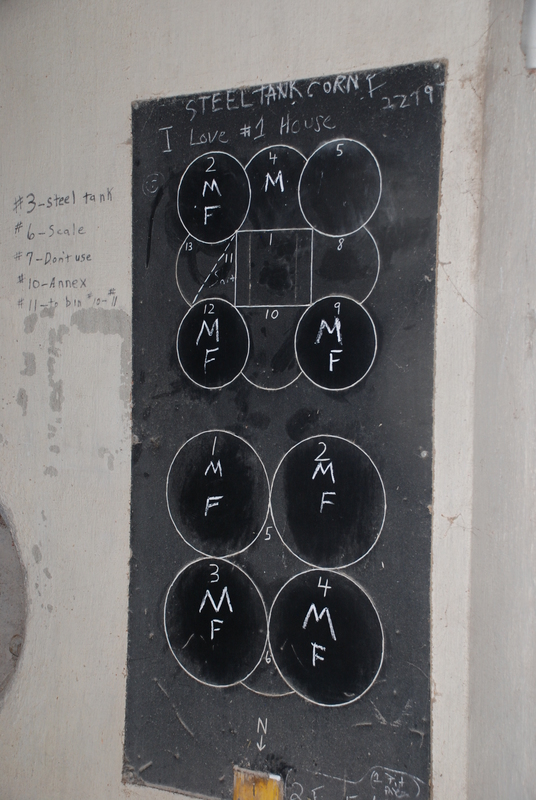 But where economics dictated, cooperatives resorted to the simple expedient of horizontal storage. In the Farmers Elevator Guide during the 1940s and 1950s, between the slick ads for elevator builders, companies advertized Quonset-style buildings for flat storage. A common sight in Nebraska and Kansas are long, flat piles of corn covered in tarps held down with old tires. At one grain facility, I saw a front-end loader filling grain trucks from one end of one of these great corn piles. At another, workmen were hurriedly applying tarp and tires in advance of a rainstorm. It seems the demand for ethanol has once again ramped up corn demand beyond the capacity of vertical storage facilities, or at least the ability to pay for them. 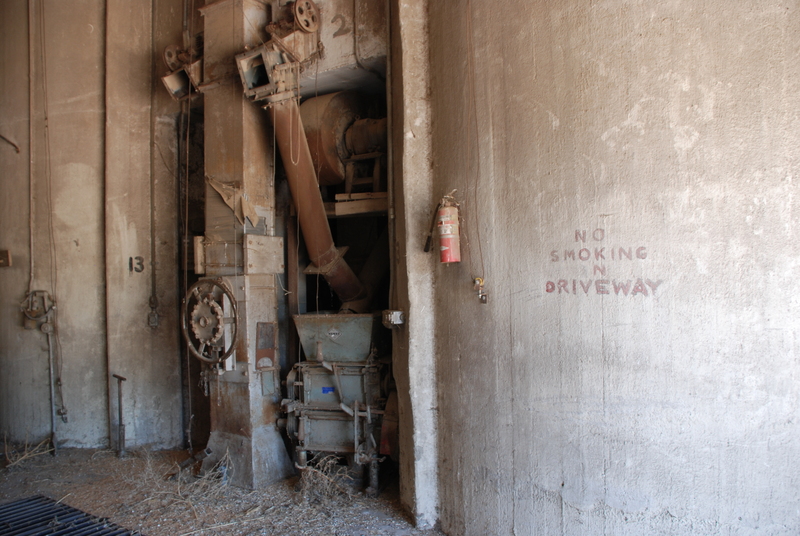 Mitchellville, Iowa: the Heartland Co-op elevator with the former feed mill and dryer. One of the two old flat-storage buildings for corn is in the foreground. 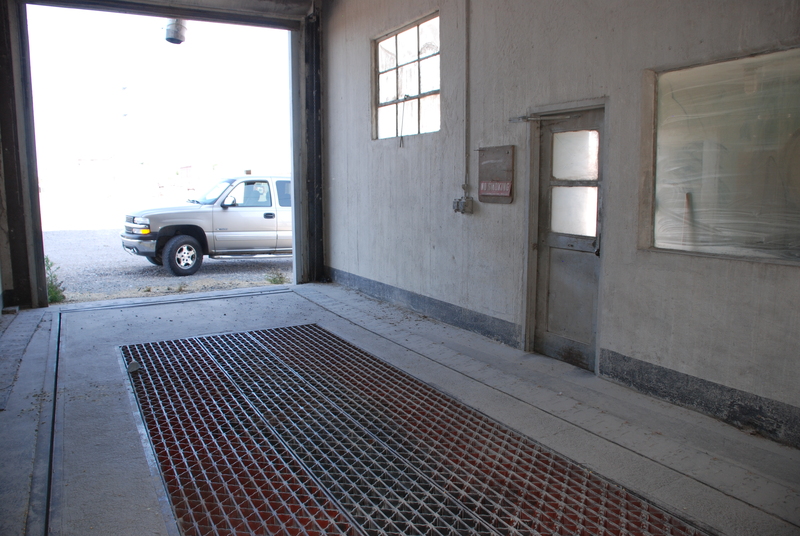 At two of the sites I recently visited, where the Tillotson-built elevators became insufficient for their purpose within a few years, I saw examples of corrugated-style flat-storage buildings that were added after the original elevators were filled to capacity. These served during a brief stretch of time until replaced by more modern, efficient bins, when the buildings found other uses. They were well suited for many farm needs since they could house virtually anything and were built to endure, once their corn storage days ended. 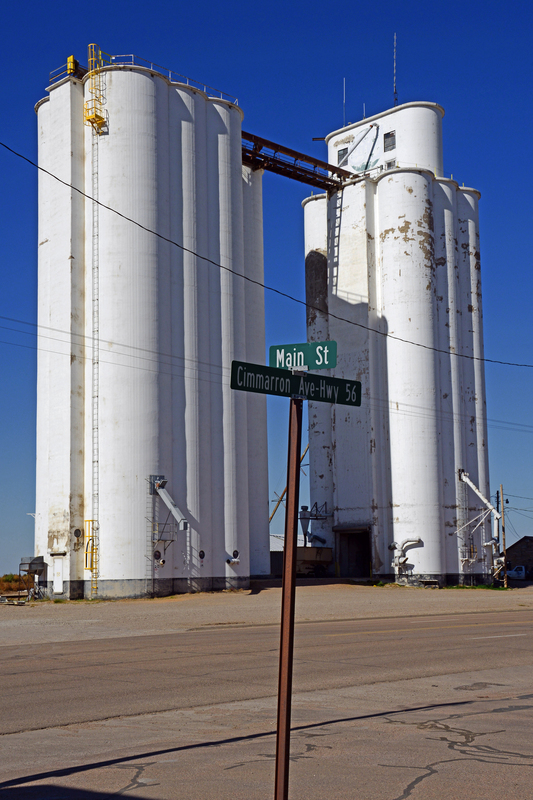 Mitchellville, Iowa, a site where an elevator built by Tillotson Construction of Omaha operates, has two such buildings. 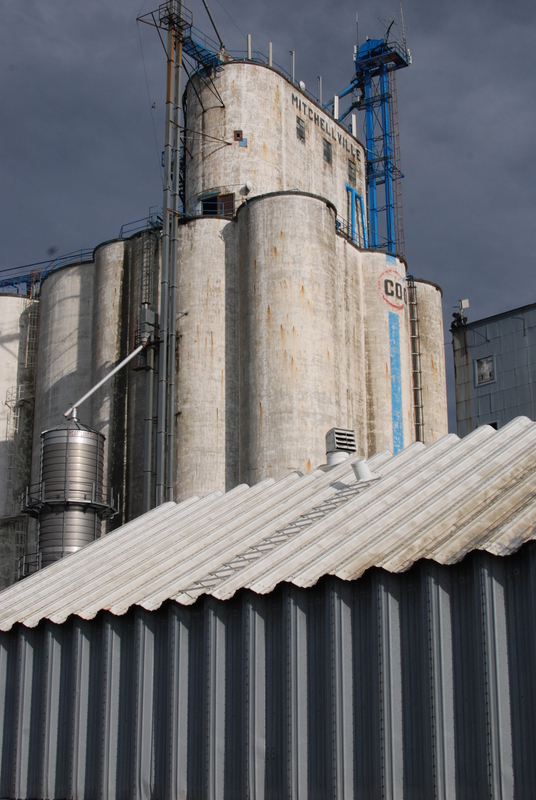 They look like ordinary metal buildings, but the tip-off to their special use is the ladder leading to an opening in the roof where the auger operates. 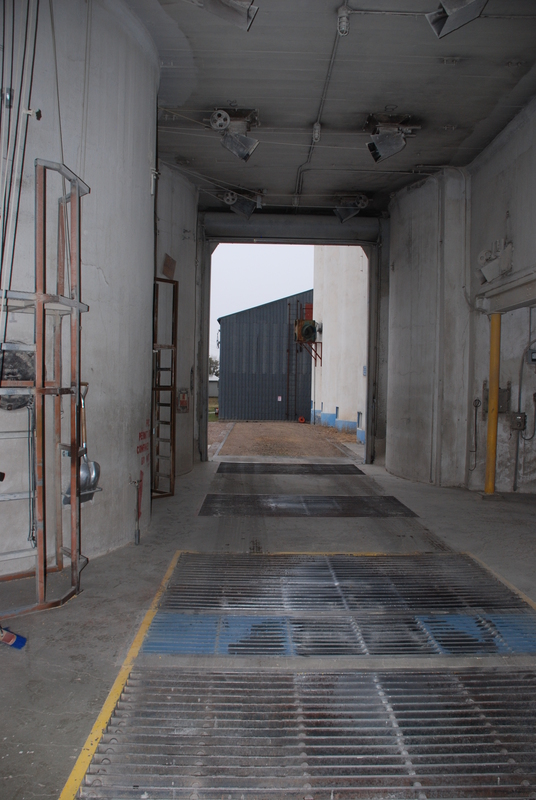 Both buildings have new jobs since the large annex additions were built beside the old elevator–one is a machine tool shed, and the other handles seed. 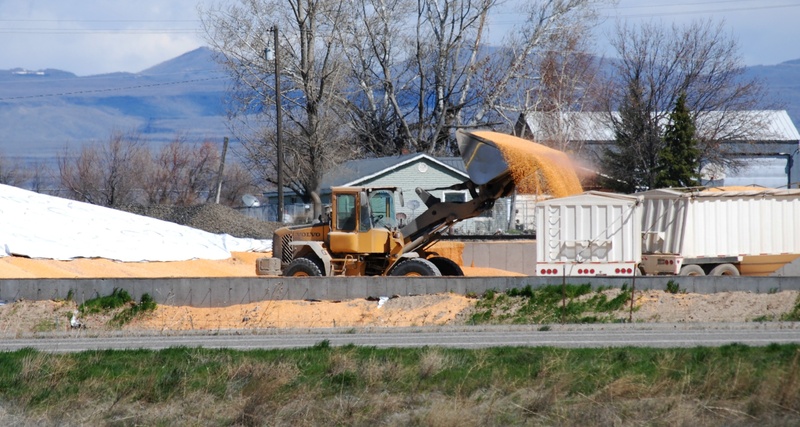 Idaho corn stored under a tarp is loaded onto grain truck. 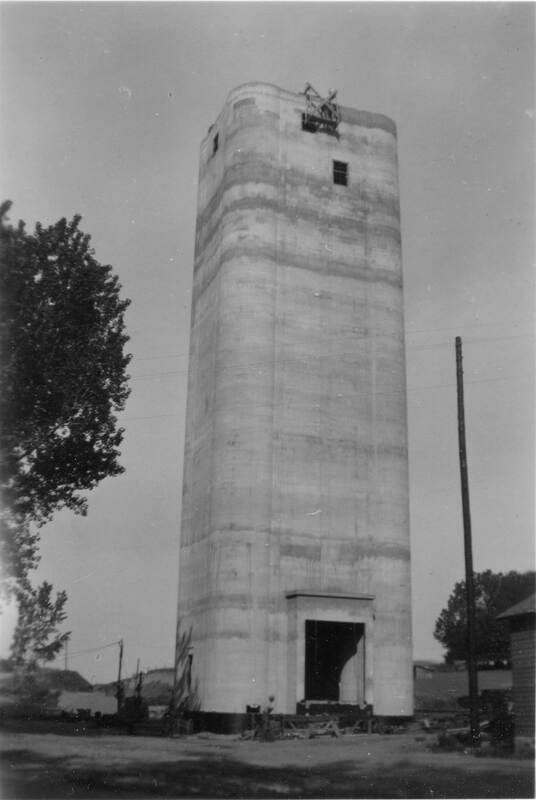 Grafel Farm elevator, built by J.H.Tillotson, Contractor, at Traer, Kan. The road to Traer, Kan., was a bit obscure. 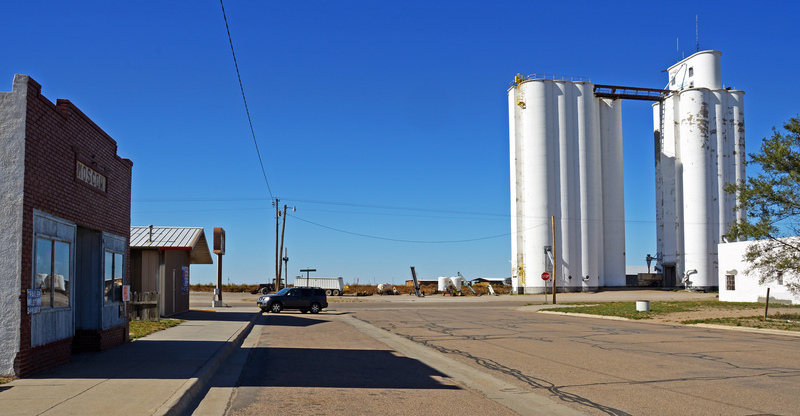 The town is south of McCook, Neb., across the border, on unpaved secondary roads. It took some navigating to get close to the elevator, and then to find the right road, once the elevator peeked over the farm fields. 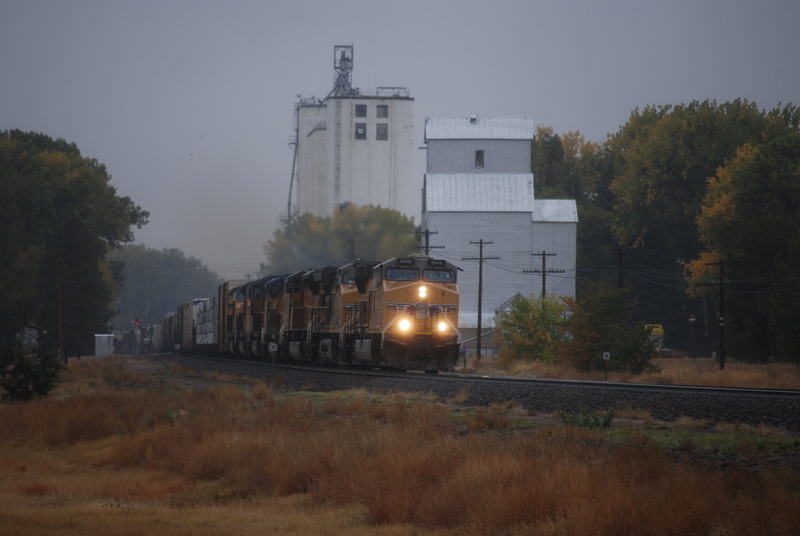 We were rewarded with a handsome, squared-up, tall elevator on a lonely rail line in a winding creek valley surrounded by farmland. I hopped out of the van in a grassy parking area and started to take pictures. A truck was parked at the weighing house by the elevator. 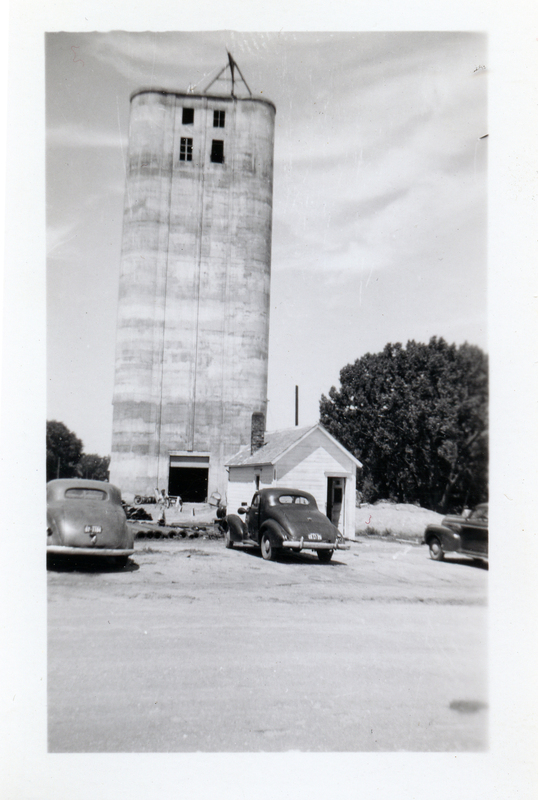 I knew this was a private farm, and it always had a privately owned elevator, from the time my grandfather built it. So I wanted to make my presence known. The elevator leg and bins. 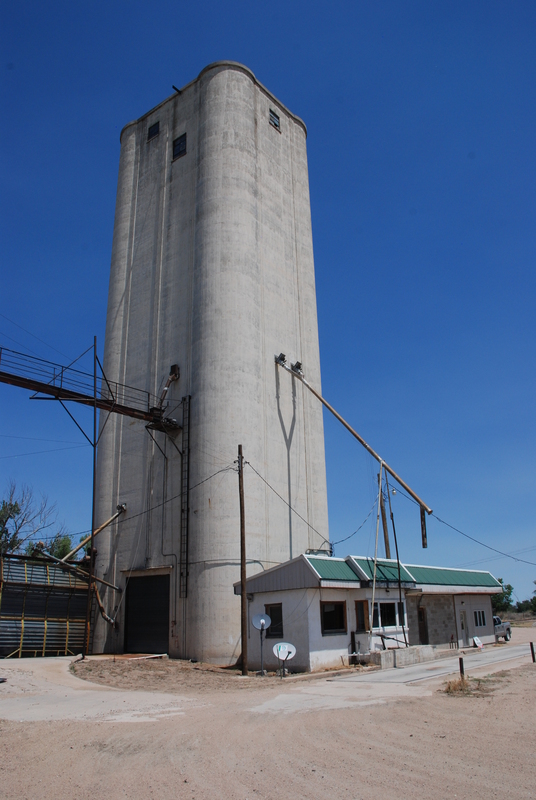 When we visited McCook’s elevator earlier in the day, worker Kelly Clapp told me the Traer elevator was still in operation. But his information was about two years out of date. Don Grafel, who greeted me when I entered the elevator office, chuckled when I asked if the elevator was working. “I wish a tornado would take it down,” he said. Don had started working at the Traer elevator as a kid. 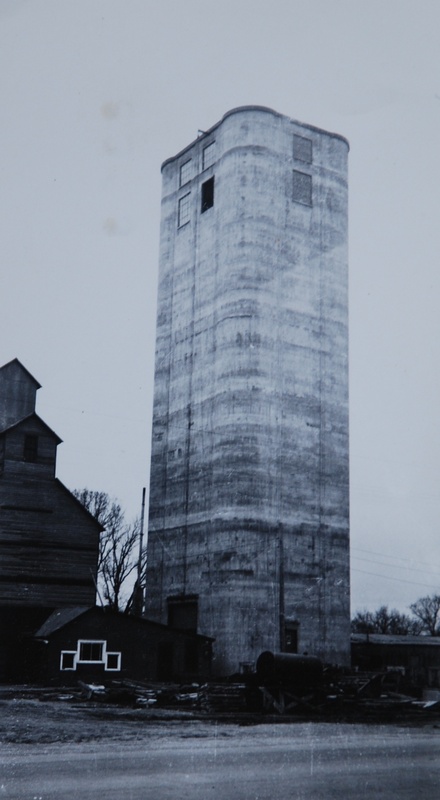 His family now leases the farmland from a granddaughter of the Anderson family, who had the elevator built, and as part of the deal, the Grafel family had to buy the elevator. The Grafels operated it for a number of years. The elevator was retired two seasons ago, Don said. The problem with the elevator was twofold. 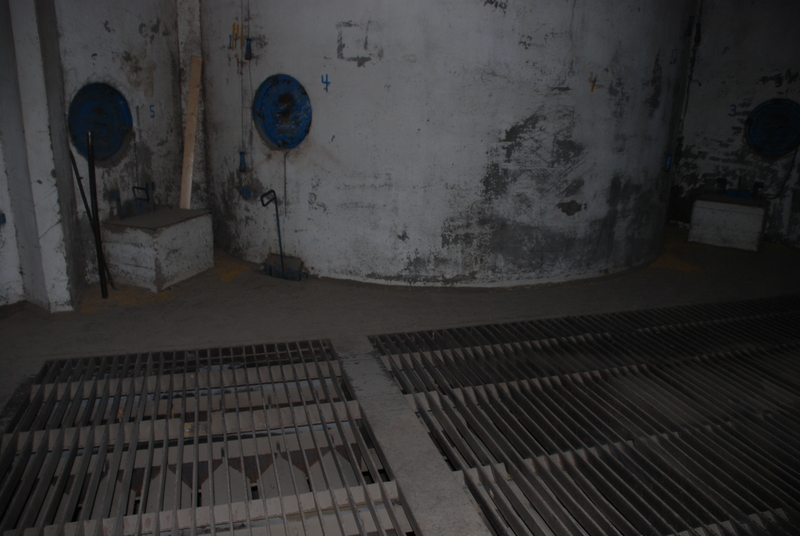 It had been built in a flood area with a high water table, and the measures taken during construction to account for the water had started to fail. It had leaking problems during wet years. But worse, the elevator was slow. 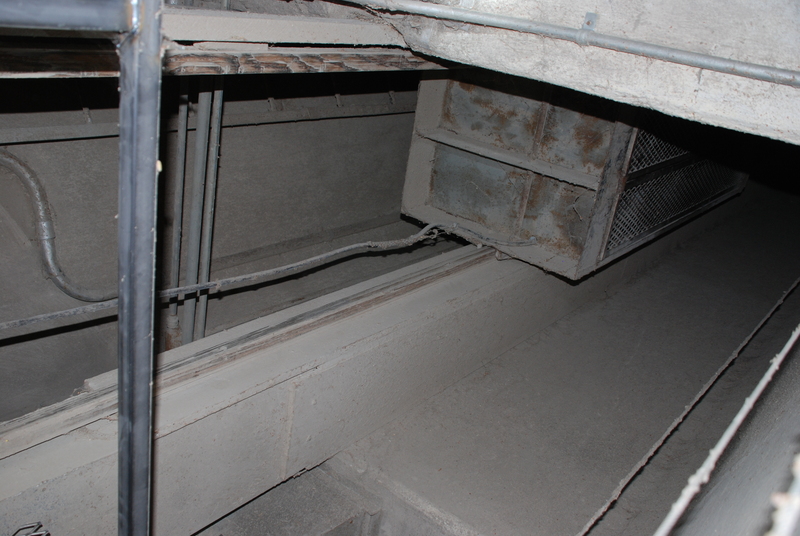 Don said the elevator could take a semi-load at a time in the pit, which was good, but it would take an hour to load the bins. Fifteen years ago, the Grafel farm placed metal bins on high ground above the town. That handled the water risk, but Don said that even those bins were falling behind demand because of slow loading. “J. 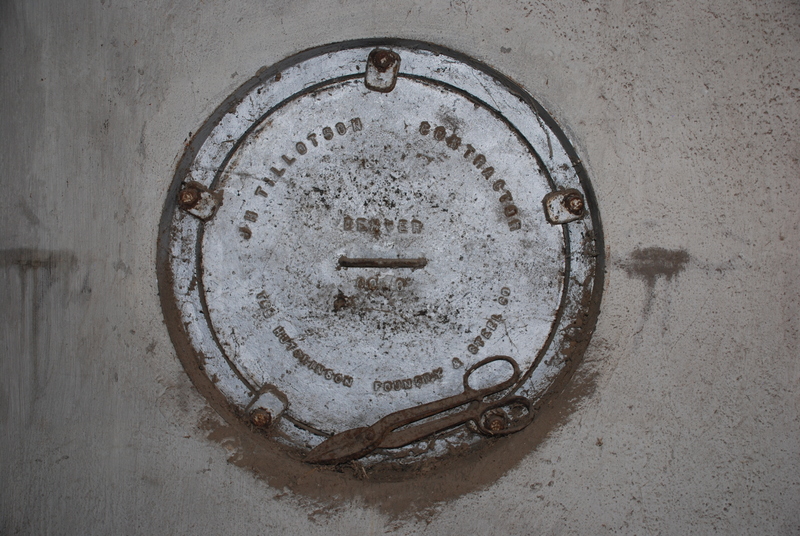 H. Tillotson, Contractor, Denver” is stamped on the interior manhole covers. Shirley Nichols, who also worked at the office, was keenly interested in the history of the elevator. I had a treat to offer her. Russell Anderson, who commissioned the elevator, wrote a letter of recommendation for my grandfather’s new company on May 6, 1949. 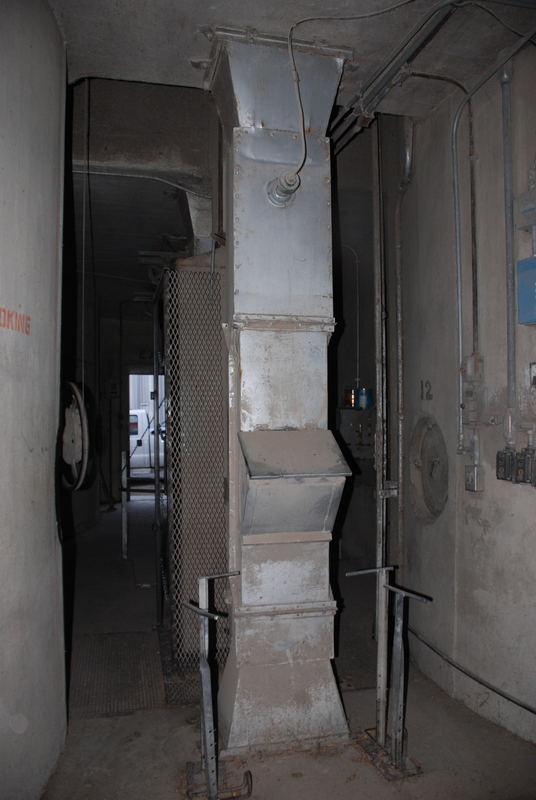 The Traer elevator was an example of Grandpa’s work before he went out on his own after working for J.H. Tillotson, Contractor. 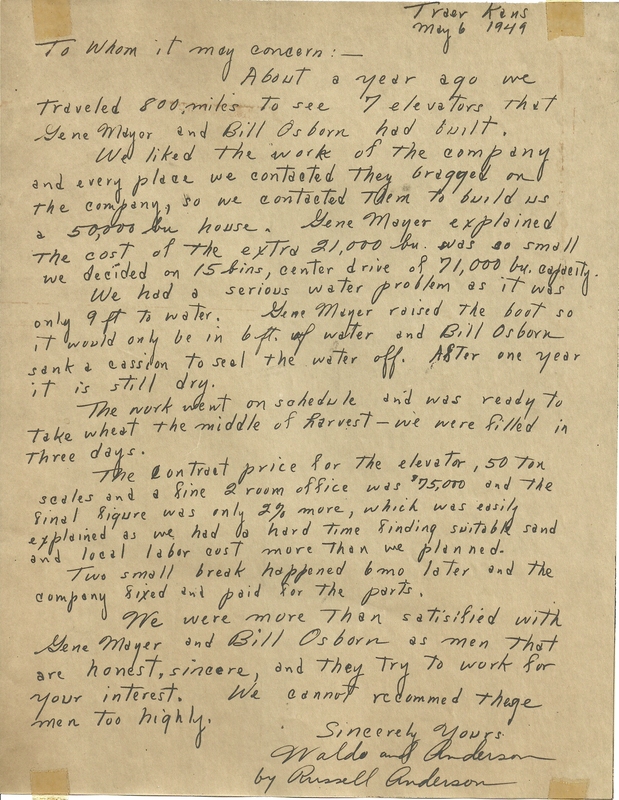 I gave a copy of the letter to her along with a photo my grandfather took during the elevator construction. In return, she gave me another construction photo and some historical pictures of the town. Finally, my hungry and thirsty children came into the office, and the visit was pretty well over. Don’s brother Greg came in after meeting my husband in the parking lot. He wondered who had dropped by. But it was time to get on the road again, before the complaints got too shrill. 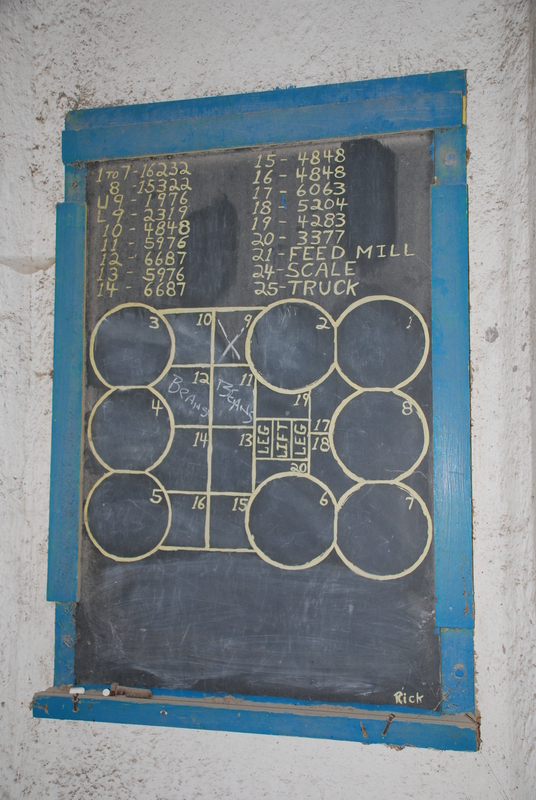 The good people of the Grafel farm made us feel very welcome, and gave us a window into the Traer elevator’s past. I’m glad we were able to see it while it still stands.